It’s one of those small, easy-to-handle books, only 100 pages or so, and the pages are of the 5 inch by 7 inch variety, but “The Rosary” may be one of the most useful gifts you wrap this Christmas. He wrote “The Rosary” as a short introduction on how to listen to God’s words in day-to-day life and as a reminder that we are never alone. There’s some introductory pages that offer down-to-earth questions you may have asked yourself at one time or another, like: How long have Catholics been praying the Rosary? What’s the point of repeating Hail Mary’s over and over? What’s behind the “mysteries” of the Rosary? 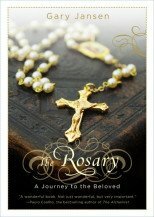 See the Rosary as sitting with Mary and paging through a scrapbook of Jesus’ life; it will let you know Jesus on a whole new level, an emotional one, a loving one, and a familiar one. But can we ever just sit and take the time to do the Rosary? Become a character in the scene (for example, a waiter in the gospel story of the Wedding Feast at Cana), and ask yourself how you might have reacted, what you would be thinking were you there at the time, what you might have done in response. Don’t know thing one about the Rosary? There’s an easy to use how-to section. After you’ve read those introductory pages, though, you’ll find Jansen’s work useful time after time as you pray The Rosary. Just pick up at Page 39. You’ll see the opening prayers, and then a scripture passage and beautiful painting that goes with each of the 20 mysteries to help you focus on that aspect of Jesus’ life story. None is more than one page, most very short, and the simplicity is perfect for helping target your attention. Art buffs will appreciate the credits in the back that identify each of the paintings and their artists.